BinaryMate, Guaranteed Processing of Withdrawals Within the Hour. BinaryMate is a newly established binary options trading platform. Although a new player to the industry, it has drawn a lot of attention from many binary options traders. This is largely due to the fact that this binary options broker takes less than an hour to process a withdrawal request. With other brokers, the typical withdrawal processing time ranges from one business day to 3 business day. By guaranteeing that all their clients’ withdrawal requests will be processed within an hour, BinaryMate has set a new standard by which other binary options brokers in the industry are now hard-pressed to follow. We rated the BinaryMate bonus section at 80/100, as the broker offers its traders up to a maximum of 100% bonus. For the trading platform, it scored a reasonably high score of 75/100 as the software is user friendly. Customer support rated a high score of 90/100 as the broker offers an innovative live video chat support service. Finally for the option contract choices, BinaryMate has only managed a score of 25/100 as it only offers its traders one type of option contract, that is the classic High/Low option. The BinaryMate trademark is owned by a holding company called Finance Group Corp (FGC). FGC is based in Vanuatu and comes under the jurisdiction of the Vanuatu Financial Services Commission. It also owns several popular binary options trading brands such as Finrally and BinaryCent. As for the management of BinaryMate, it is managed by a subsidiary management company called Suomen Kerran LP. Based in Edinburgh, Scotland, the company’s head office is located at Centre Office, 58A Broughton Street, Edinburgh. If you are a binary trader that is dissatisfied with the time it takes for your withdrawal requests to be processed by your broker, then perhaps it’s time to switch to a broker who can do the job faster. Apart from the one hour withdrawal processing time, BinaryMate is also able to offer its traders a wide range of instruments to trade with. They also offer their clients bonuses as high as $100,000. Customer support is backed by a team of professionals who are available to provide assistance to their clients on a 24/7 basis. To provide their clients with access to the financial markets, BinaryMate uses a web-based trading platform. Accessible with any modern web browser, the platform doesn’t require traders to download or install any software. As for the functionalities of the trading platform, it is well designed with a user friendly interface. No training is required for traders to operate the trading platform. The simplistic design of the trading platform is like that on purpose, as BinaryMate has sought to make trading binaries as simple as possible. The platform has been laid out in such a manner so all the crucial information is within view. 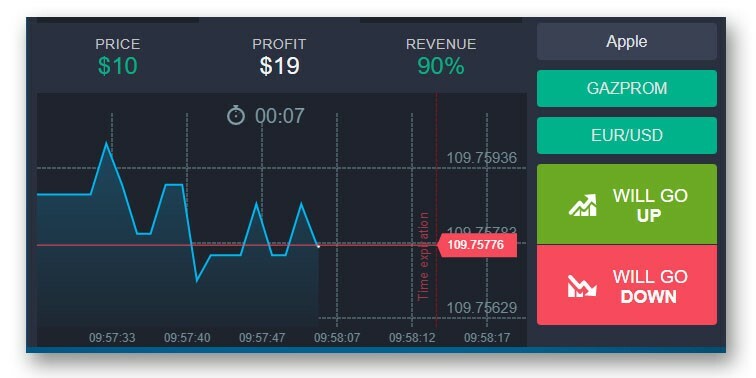 With the trading chart prominently displayed in the centre of the trading screen, traders can easily keep track of all the price movements in the market. With smartphone ownership at an all time high of 7 billion users worldwide, BinaryMate is also aware of the fact that a large portion of the binary options trading community is comprised of smartphone owners. To cater to this group of traders, BinaryMate has also provided dedicated mobile trading apps geared towards iOS and Android powered devices. The apps are provided free of charge and can easily be downloaded from Apple’s App Store and Google Play Store. Now with the mobile trading app installed onto their smartphones, BinaryMate’s traders can keep track of all the developments in the market regardless of where they are. BinaryMate’s coverage of the financial markets is fairly extensive. The markets covered include major asset classes such as Commodities, Currency pairs, Equities and Market Indices. Altogether, BinaryMate is able to offer its traders a choice of more than 160 types of underlying assets. This is quite a feat as it is rare for any newly established binary options brokers to be able to offer such a wide range of underlying assets. The following table shows the list of assets that are currently available for trading at BinaryMate. For traders at BinaryMate, they have a selection of three different types of trading accounts to choose from. These include the Bronze Account, the Silver Account and the Gold Account. With binary options trading, traders are not charged any fees for making a trade. The premium that they pay on the option contract represents their entire trading cost and investment for each transaction. As for the returns on investment, it depends on the type of assets that is being traded. Typically, a trader at BinaryMate can earn a maximum return of 90% on his investment. For funding and withdrawal of funds, traders at BinaryMate can use a variety of methods such as credit/debit cards, eWallets and bank wire transfer. These include Visa, MasterCard, Skrill, Neteller and Perfect Money. Alternatively, BinaryMate’s traders can also fund their trading account using cryptocurrencies such as Bitcoin, Altcoins and Ethereum. Another striking feature about BinaryMate which makes it stands out from other brokers in the industry is its live video support service. To date, BinaryMate is the only broker in the industry that offers live video support. Apart from the live video support, traders at BinaryMate can also contact the support team on the telephone by calling them on the telephone support number provided. While BinaryMate lacks a section on trading education, the broker makes up for this deficiency by holding weekly trading contests with attractive prizes. Each week, 20 winners will be selected to claim prizes worth up to a total of $20,000. From our observation, the services offered by BinaryMate are fairly impressive considering the fact that it is a new broker. This shows that the broker is competent enough to compete on equal grounds with the leading brokers in the industry. In fact, the one hour withdrawal processing time guaranteed by BinaryMate is now setting a new standard on how binary brokers should process their clients’ withdrawal requests. Equally impressive is the live video chat service provided by BinaryMate. To date, no other binary brokers in the industry have been able to provide the same level of support. Surely with all the features that BinaryMate is offering to traders, the broker is worth a try. Yes. BinaryMate is operating under the umbrella of the Finance Group Corp is regulated by the Vanuatu Financial Services Commission. What are the methods available to fund my trading account? Funding of trading accounts can be done through Bank wire transfer, credit cards, eWallets and cryptocurrencies. What is the minimum amount which I can deposit at BinaryMate? The minimum deposit requirement at BinaryMate is $250. BinaryMate guaranteed that all withdrawal requests will be processed within the hour.